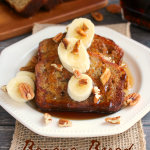 If you like Banana Bread then you’ll love this decadent, delicious Banana Bread French Toast! 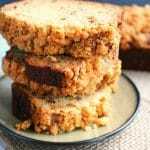 A simple, easy French toast recipe made with thick slices of moist, delicious banana bread, its the ultimate breakfast or brunch dish! It starts out with a good loaf of Banana Bread. I have a great recipe, which is my Award Winning Banana Bread recipe. 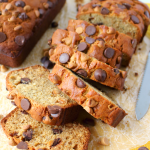 This recipe has won several 4-H Purple ribbons and its the ONLY banana bread recipe I use. 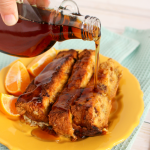 The flavor and consistency is perfect, and it works wonderfully when made into French Toast. My Purple Ribbon Banana Bread recipe makes two loaves. We typically eat one, and I put the other in the freezer. This time, I used that second loaf for this wonderful breakfast! 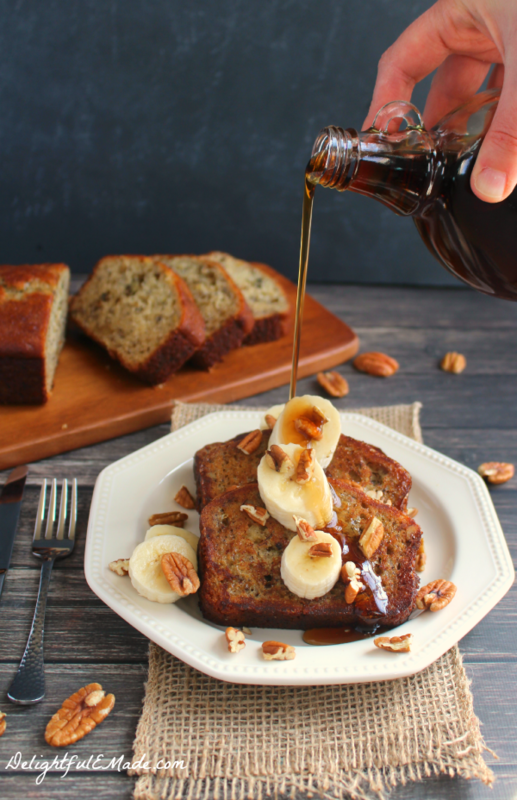 I topped this Banana Bread French Toast with warm maple syrup and some chopped pecans. This is such a warm, tasty breakfast – pair it with some delicious bacon or sausage links and you’ll be set! A simple, easy French toast recipe made with thick slices of moist, delicious banana bread, its the ultimate breakfast or brunch dish! Heat a skillet to medium high heat, and grease with shortening. Whisk together the milk, eggs, sugar, cinnamon and nutmeg. Slice the banana bread into 1/2"-1" slices. Dip the slices into the batter on both sides, and add to the hot skillet. Let cook on each side for 1-2 minutes or until golden brown. Serve hot with syrup, banana slices and pecans. Enjoy! Oh! This looks so yummy! I'd love to invite you to link up to my Friday Favorites linky party! This looks incredible, Erin! 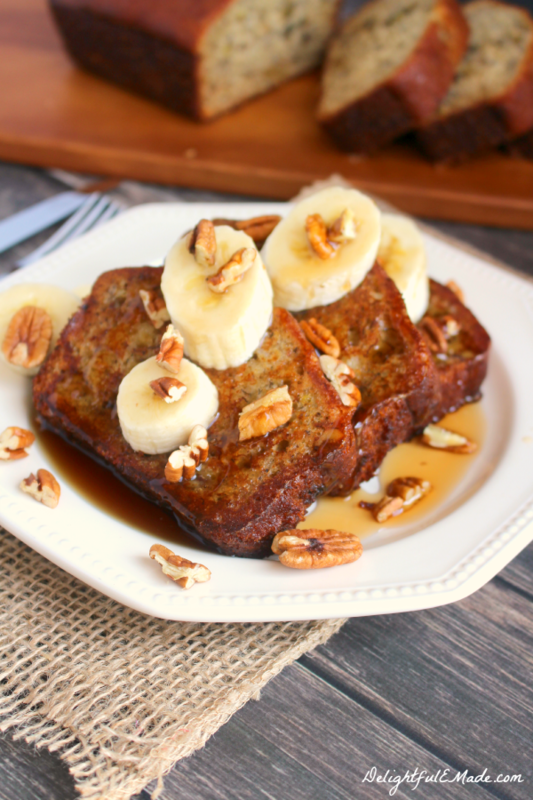 Love the idea of banana bread french toast! It looks like the perfect weekend breakfast! Oh my goodness, what a great idea!!! I make banana bread so often, and never thought of doing this! I will have to use a couple slices to make some French toast next time!!!! Sounds absolutely delicious!!! This looks fantastic! 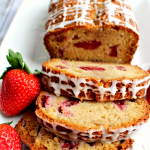 I love banana bread and french toast so together this would be devine. I can't even express how excited I am to try this out! 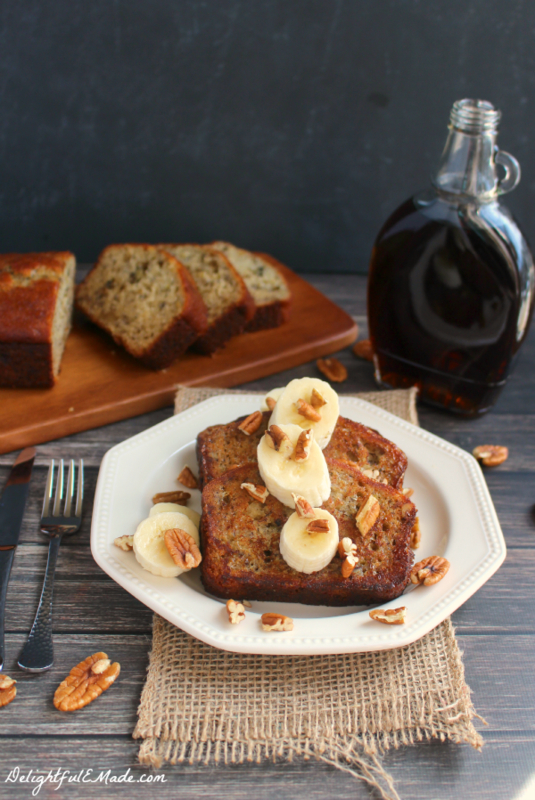 Banana bread is one of my all time favorite things, and what better way to enjoy it than in the form of french toast! Yum!! This would go over big at my house! Pinned! This looks amazing! 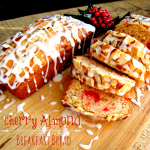 I love the idea of using the banana bread! Stopping by from This is How We Roll Thursday. Thanks! Yummy! 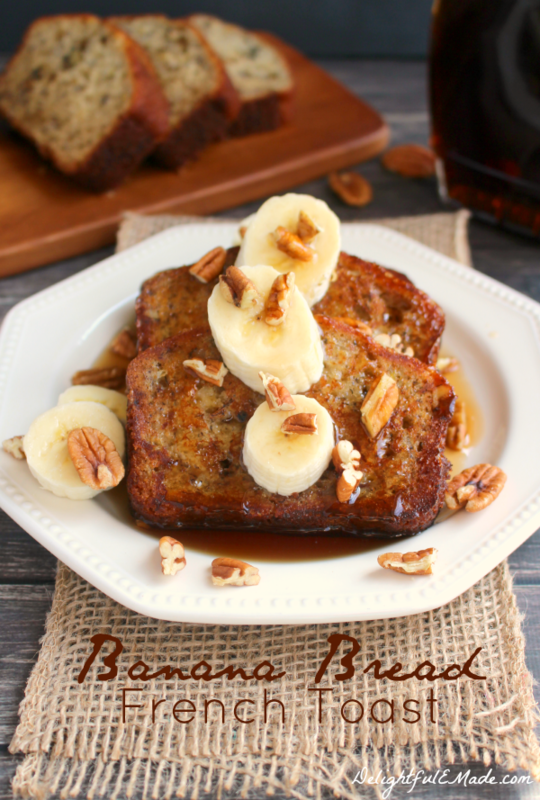 Banana bread french toast is the best and now I can't wait to try your banana bread recipe. Thank so much for bringing it by Throwback Thursday and making me hungry! How yummy does this look?!!! 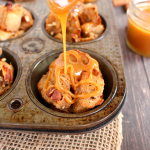 I love breakfast for dinner so this is on the list! Thanks for sharing with us at #FoodieFriDIY - hope to see you again this week!